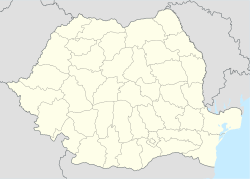 Bârghiș (German: Bürgisch; Hungarian: Bürkös) is a commune in the northern part of Sibiu County. It is situated in central Romania, in the historical region of Transylvania. The commune is composed of six villages: Apoș, Bârghiș, Ighișu Vechi, Pelișor, Vecerd, and Zlagna. Pelișor has a fortified church. At the 2011 census, 86.4% of inhabitants were Romanians, 5.9% Roma, 5.2% Hungarians and 0.7% Germans. This Sibiu County location article is a stub. You can help Wikipedia by expanding it.